There is a big difference between BRIGHTENING your skin and BLEACHING your skin. I believe everything can be done in moderation, especially if you use the right products. 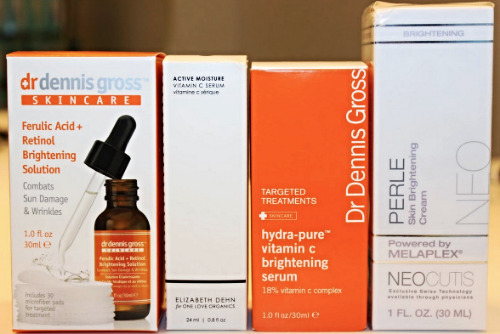 There are many products that do both, but the best way to combat hyper-pigmentation or skin-discoloration is through the use of brightening products that do not contain hydroquinone. Hydroquinone is a bleaching agent that can be damaging to skin, causing blotches and irritation. I have a few dark marks on my face from "accidentally" popping stubborn pimples so I know a few things about hyper-pigmentation, and the self conscious feeling one experiences. Here are a few products that we carry at Cedra that will help to lighten up dark marks, and brighten up your skin tone in no time. Stop by Cedra Pharmacy at 1207 2nd Ave, NY, NY 10065 for your free consultation. WHAT ABOUT THOSE DARK CIRCLES?